Alvechurch’s second Pumpkin Festival was a real community event, with villagers creating and growing some amazing exhibits. The Festival generated more than £1,000 for Alvechurch Village Hall and Papyrus (Prevention Of Young Suicide). Organisers would like to thank everyone who took part in or visited the Festival, plus The Lounge and the library who handed out entry forms, and Jayne at The Weighbridge who made and donated the pumpkin soup, which added to the array of pumpkin-themed refreshments. Next year’s event is planned for Saturday October 26, again in the Village Hall, and this time you’ll be able to vote for your favourite pumpkin! Details and updates on the Alvechurch Pumpkin Festival Facebook page. 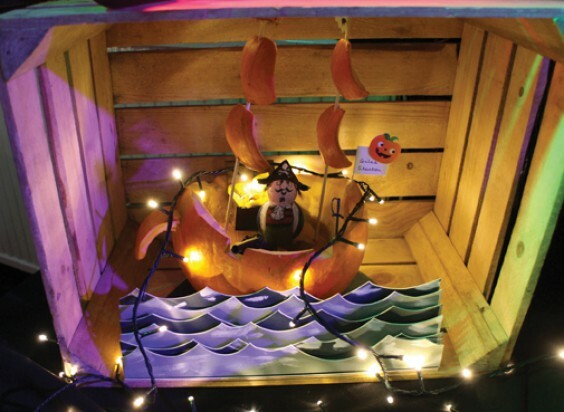 As part of the Pumpkin Festival, village shops and businesses were invited to enter a Best-Dressed Window competition, judged by The Village magazine. 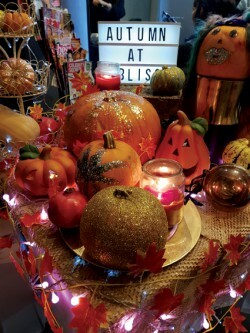 There were some very inventive entries, including those from Imagination hair salon and Barber Dave, but the hands-down winner was Bliss Hair Therapy on Red Lion Street for a glittering, multi-pumpkin display (right) which really came into its own after dark.